Our next LBS Committee meeting is Thursday 16th May, 8pm-9pm at the King Edward Hall. Anyone interested in what we’re planning, has fund raising suggestions, or just wishes to get involved or help is welcome to come along. If there’s something particular you would like to discuss please let us know in advance via the Contact Us section of our web site. For April LBS will hold its AGM on Thursday 18th April, 8pm-9pm at the King Edward Hall. Anyone interested in what we’re planning, has fund raising suggestions, or just wishes to get involved or help is welcome to come along. 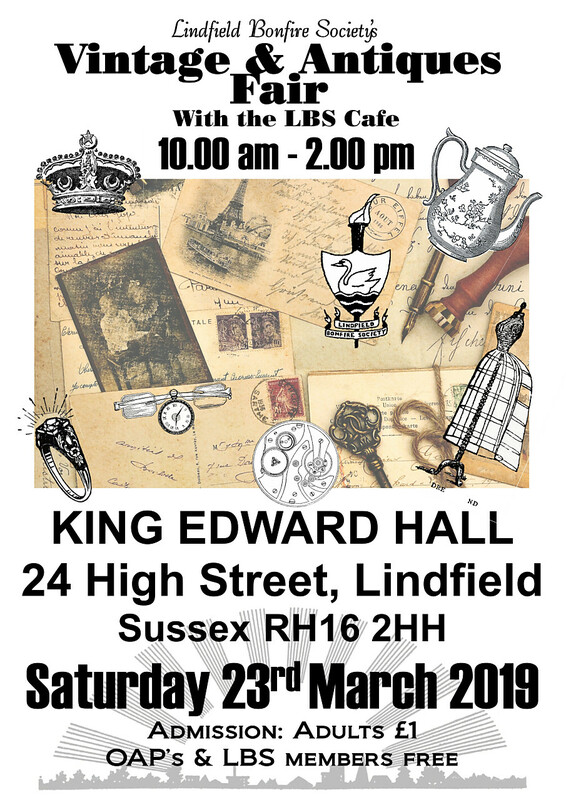 You are warmly welcomed to our vintage and antiques fair being held in the heart of Lindfield at the King Edward Hall between 10am and 2 pm. We will have stalls offering offering jewellery, vinyl records, books, maps, clothing, homewares, furniture and more! The LBS cafe serving hot drinks, bacon rolls and cake all day. All proceeds raised are in aid of Lindfield’s procession, bonfire and grand fireworks display on November 5th. All members, supporters and friends are welcome to attend the LBS Annual dinner at The Bent Arms Saturday 30th March. Dress is smart casual, and we always have a fantastic time! Dinner will be served promptly at 7.30pm. There will be a raffle, please donate a prize if you are able. This event is always a sell out, so please don’t leave it until the week before to book! Please contact Wendy Box by telephone or letter with your order and payment (which must be in a week before the evening please with cheques made payable to The Bent Arms). If you have specific dietary requirements please let Wendy know asap. 7.30pm. There will be a raffle, please donate a prize if you are able. This event is always a sell out, so please don’t leave it until the week before to book! Coffee/tea and dessert – please ask your waitress and pay them on the night for these. This month’s LBS Committee meeting is Thursday 21st March, 8pm-9pm at the King Edward Hall. Anyone interested in what we’re planning, has fund raising suggestions, or just wishes to get involved or help is welcome to come along. Hello and welcome to the official web site of Lindfield Bonfire Society. Bonfire Night has long been celebrated in Sussex, and since 1894 the picturesque village of Lindfield has held a regular Bonfire Night celebration on November 5th (or on Saturday the 4th if Bonfire Night falls on a Sunday). 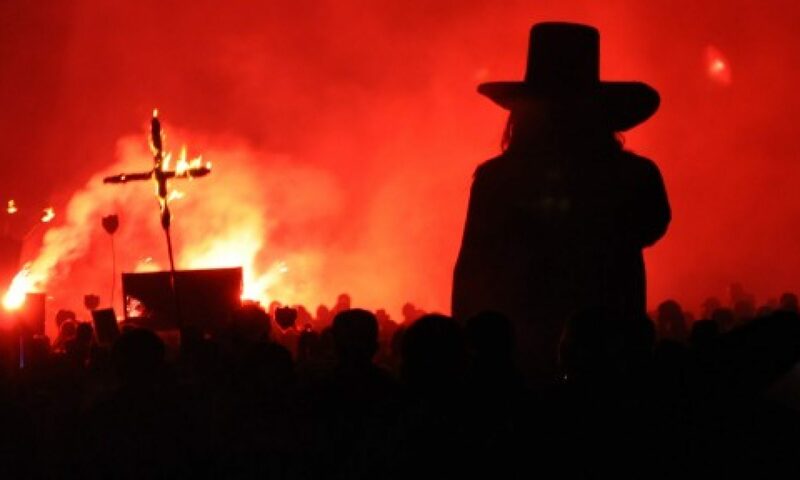 This age-old tradition is continued by Lindfield Bonfire Society, who work throughout the year to organise and fund our Village Bonfire Night celebrations. The money raised on the night is in aid of local children's charities. Lindfield Bonfire Society is as non-profit making organisation, who rely upon the time and effort put in by both Society Members and the local community to help keep this free Bonfire Night celebration going. We hope you enjoy our web site, and look forward to seeing you on our Bonfire Night and at the other events we attend throughout the year. The Lindfield Bonfire Society is a non-profit making organisation that donates to local children's charities. Please help support us by making a donation small or large.